Spray drift from temperature inversions is a major problem for pesticide applicators. This publication is written to help them decide if a spray application should be made or if there is significant potential for spray drift to occur. Pesticide spray drift always has been a costly and frustrating problem for applicators. It’s particularly frustrating because some of the seemingly best weather conditions for pesticide application are often the worst. That is because those conditions are caused by air temperature inversions. Air temperature inversions provide near-perfect conditions for tiny, aerosol-size droplets to drift away from their targets. Understanding inversions is essential to following state and federal regulations that prohibit pesticide application during inversions, observing pesticide manufacturers’ warnings about inversion conditions on product labels and preventing unintended pesticide contact with nontarget areas. An understanding of air temperature inversions – why they occur, their characteristics and their dissipation – requires a basic understanding of energy transfer at the Earth’s surface and in the lower layers of the atmosphere. The microclimate is defined as the climate near the ground. For our purposes, it consists of the lowest 20 to 30 feet of the atmosphere, the soil surface or anything covering it, and the top foot or two of soil. The microclimate is best characterized as a region with rapid changes in air temperature, wind speed, humidity and/or dewpoint temperature occurring over short distances and/or in short time periods. It is also a region of air and surface temperature extremes. 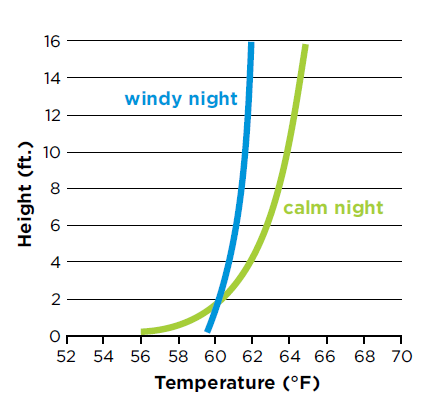 Surface characteristics usually determine weather conditions in the microclimate, especially when wind speed is low. Understanding air temperature inversions requires a basic understanding of numerous energy transfers that cause the Earth’s surface temperature to increase or decrease and microclimate air and soil temperature to change. Surface temperature always refers specifically to the temperature of the Earth’s soil surface or the surface temperature of anything covering the soil surface that is exposed to the atmosphere. It is not an air temperature. Air temperatures vary greatly near the Earth’s surface, depending on weather conditions and surface characteristics. For example, around sunrise on a clear, nearly calm morning, air temperature measured 5 feet above the surface may be 4 to 10 F greater than the air temperature measured near the surface. Conversely, in early afternoon on a nearly calm, clear day, the air temperature at 5 feet could be 4 to 15 F less than the air temperature near the soil surface. Actual air temperatures depend on surface conditions. Standard air temperature measurement conditions were established in the late 1800s so that air temperature measurements from different locations would be comparable. As a result, official thermometers were located at a standard height of 5 feet above a turf-covered surface. They were placed inside a white, louvered (ventilated) box with a double roof to shield them from direct and indirect heating by the sun and direct radiation cooling to the clear night sky. Radiation is probably the most important energy transfer in our lives because the sun provides all of the energy that supports life on Earth. Our first radiation lesson is that everything emits electromagnetic radiation (EMR). That means the sun, stars, water, ice, snow, clothes, skin, the paper you’re reading, the walls, hot coffee, etc. – everything! Following emission, this radiation energy propagates in all possible directions from its source in the form of electromagnetic (EM) waves. Surface temperature determines the amount of radiation and the range of wavelengths emitted. The hotter the surface, the shorter the wavelengths emitted, and the more total energy lost from the surface. One important fact to note is that regardless of temperature, surfaces always are emitting radiation and losing energy. If no other energy replaces this loss, the surface temperature decreases. However, at the same time, these surfaces also are gaining energy because they are absorbing radiation emitted by other surfaces. Because the amount of energy emitted by a surface increases exponentially as its temperature increases, small surface temperature changes cause relatively large changes in the total emitted radiation energy. The sun’s surface emits radiation at a temperature of 5,727 C (10,341 F). As a result of this high temperature, solar radiation consists of very short wavelengths that carry large amounts of energy. About 44 percent of the sun’s total emitted radiation energy is in visible wavelengths. Radiation emitted by the much cooler surfaces on Earth has far longer wavelengths that carry only small amounts of energy, compared with solar radiation. For this reason, radiation emitted from surfaces on Earth usually is referred to as long wavelength radiation, compared with the short wavelength radiation emitted by the sun. The Earth’s atmosphere is nearly transparent to most solar radiation. Solar radiation that reaches the Earth’s surface is absorbed, reflected and/or transmitted, depending on surface characteristics. The more nearly perpendicular the incident solar rays are to a surface, the greater the solar energy available to the surface. Absorption and reflection of solar radiation depends mostly on surface color. Lighter-colored surfaces reflect more and absorb less incident solar radiation. Conversely, darker-colored surfaces reflect less and absorb more incident solar radiation. Reflected radiation continues traveling through the air until it strikes a surface that absorbs, reflects or transmits it. Absorbed radiation nearly instantly is converted to heat energy at the surface. Darker surfaces absorb more solar radiation on sunny days, so they are usually warmer than lighter surfaces. Shortwave radiation also is produced by very hot surfaces or processes on Earth, such as fire, welding, stove burners and light bulb filaments. Because temperatures on Earth are much lower than the sun’s temperature, radiation emitted from Earth’s surfaces consists of far longer wavelengths that carry much less energy, compared with solar radiation. This long wavelength (longwave) radiation is emitted in all possible directions from a surface, but 97 to 98 percent of the radiation is absorbed by whatever surface it hits, and only 2 to 3 percent is reflected. Longwave radiation absorption does not depend on the type of surface or its color. Longwave radiation usually is called infrared radiation. Surface temperature is measured with an infrared thermometer that measures the infrared (longwave) radiation emitted by the surface, and that measurement is used to calculate the surface temperature. Prior to the development of these instruments about 25 years ago, accurate measurement of surface temperature was nearly impossible. Absorbed solar radiation begins to heat the Earth’s surface shortly after sunrise. As the surface temperature increases, energy from the warmer surface slowly is conducted into the cooler soil. Conduction is the process by which heat energy is transferred from warmer to cooler areas by molecular contact. The interior of solids can be heated only by conduction. Simultaneously, energy is conducted from the Earth’s surface to the adjacent cooler air molecules. As the sun continues rising, more and more solar energy is absorbed, and the surface temperature continues to increase. Also simultaneously, more energy is conducted into the soil and the overlying air. As the air temperature near the surface increases, the heated air expands, making it less dense than air above it. This lighter air begins rising while the cooler, denser air above it begins sinking. When the cooler air reaches the surface, it is warmed by the surface and rises, simultaneously allowing cooler air to descend. Thus, tiny circulation cells are formed that slowly warm a thin layer of air near the surface. As the sun continues rising, solar rays become more perpendicular to the surface, and surface heating intensifies. This causes the tiny circulation cells to grow larger vertically and horizontally. The air temperature profile in Figure 1 shows that air temperature a few hours after sunrise is greatest near the surface, and air temperature decreases with increasing height. Notice that the largest temperature gradients (greatest temperature changes with height) occur closest to the surface. As surface heating continues, rising columns of warm air continually transfer more and more heat energy from the surface to greater and greater heights, and the descending air around each column transfers cooler air to the surface to be warmed again. Energy transfer by the spontaneous movement of air or liquid is called convection. Convection cells continually grow larger as surface heating continues and eventually can reach heights of 100, 1,000, 5,000 feet or more by early afternoon on a clear day. The appearance of late-morning or afternoon cumulus clouds that often form at the top of the rising warm air columns are proof that convection is occurring. Summing up: On a clear morning, the sun heats the surface and the surface heats the air. When the atmosphere is dominated by vertical air motion, the air is extremely turbulent, and the atmosphere is labeled unstable. An unstable atmosphere will cause rough rides in airplanes. On clear mornings with little or no wind, convection cells consisting of rising and sinking columns of air warm the lower atmosphere. These convection cells gradually grow larger and larger throughout the morning. By late morning, mixing and air turbulence between the warmer air and the cooler air often causes light, but gusty, variable-direction winds near the surface. These light winds are part of the convection process that’s heating the lower atmosphere. In mid to late afternoon when the sun is going down, these convection cells slowly weaken, cumulus clouds slowly evaporate and wind speeds decrease, sometimes to near zero. Wind speed is zero at the Earth’s surface, increasing exponentially with increasing height. During windy conditions, any surface unevenness or obstruction causes air to flow over or around it, resulting in horizontal and/or vertical eddies of various sizes and shapes. The result is a random, chaotic, swirling motion called turbulent flow in which wind speed and direction change rapidly. These turbulent eddies cause air from greater heights, where wind speeds are greater and air temperatures are lower, to mix with the slower-moving, warmer air near the surface. This turbulent mixing heats the lower atmosphere more rapidly while maintaining a cooler surface temperature (Figure 2). All clouds absorb, reflect and/or transmit incident solar radiation (radiation that hits them). Water droplet clouds form at low altitudes; have sharp, distinct edges; and usually appear bright white because they reflect 30 to 90 percent of the incident solar radiation back to space. In contrast, ice crystal clouds generally are found above 20,000 feet, have fuzzy edges, appear stringy or fibrous and reflect less solar radiation. The greater the cloud cover, the more solar radiation is reflected back to space or absorbed by the clouds. Clouds reduce the amount of solar radiation absorbed by the Earth’s surface, so it warms more slowly than on clear days. On overcast days, only the solar radiation that’s transmitted through the clouds reaches the Earth’s surface. Clouds also emit and absorb longwave (infrared) radiation that causes major effects on nighttime surface cooling. This is explained in the next section. Throughout a clear day, the Earth’s surface absorbs enough solar radiation to heat 5 to 10 inches of soil and several thousand feet of air. Simultaneously, the Earth’s surface, or whatever covers it, has been emitting longwave terrestrial radiation into the atmosphere. The greater the surface temperature, the greater the terrestrial radiation emitted. When the terrestrial radiation passes through the clear atmosphere, water vapor and carbon dioxide molecules absorb some of the radiation. The remainder is lost to space. Simultaneously, the water vapor and carbon dioxide molecules emit longwave radiation in all directions. Some of this longwave, or atmospheric radiation, is directed toward the Earth’s surface, where nearly all of it is absorbed (Figure 3). Without this added energy from the greenhouse or atmospheric effect, the Earth’s average temperature would be about 59 F colder. The maximum surface temperature occurs when the solar radiation plus the atmospheric radiation energy absorbed by the Earth’s surface equals the surface’s terrestrial radiation loss. Depending on the amount of time the surface takes to warm up, the maximum surface temperature usually occurs two to four hours after solar noon (when the sun is directly in the south), and the maximum air temperature is reached shortly after that. Given clear skies, the Earth’s surface temperature begins decreasing in mid to late afternoon, when the surface is emitting more terrestrial radiation energy than it is receiving from solar and atmospheric radiation. After sunset, the only surface energy source is atmospheric radiation plus some heat energy conducted to the surface from deeper in the soil. This heat energy was conducted into the soil and stored earlier in the day. The soil surface will be cooler than the adjacent air shortly after the surface temperature begins decreasing around mid to late afternoon. Heat from the warmer air will be conducted to the cooler soil surface because heat energy always moves from warmer places to colder ones. However, the surface continues cooling because more terrestrial radiation energy is emitted than is received from atmospheric radiation and by conduction from deeper soil. As the surface temperature continues to decrease, more and more heat from the adjacent warmer air will be conducted to the cooler surface. Soon the air next to the Earth’s surface will be colder and denser than the air above it. This is the beginning of an air temperature inversion. As time passes, more and more heat energy is conducted from the nearby air and soil to the Earth’s surface, where it continues to be lost by terrestrial radiation. Air farther and farther away from the surface also will cool as energy slowly is conducted through the air toward the colder surface. As long as skies remain clear, the surface temperature continues to cool the overlying air. Air temperature measured at various heights near the surface during a clear night shows that the air temperature nearest the surface is always the coldest. 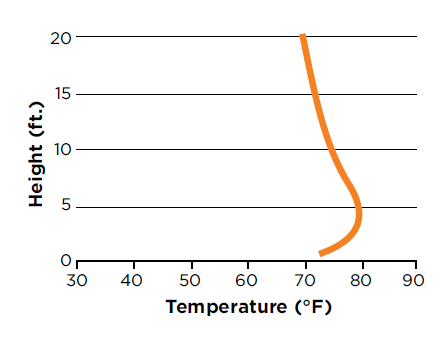 And at each greater height, air temperature is greater than the temperature at the next lowest height (Figure 4) up to top of inversion , (Figure 6). By definition, this increase in air temperature with increasing height above the surface is called an air temperature inversion because it’s the opposite of the usual daytime air temperature profile. The Earth’s surface continues cooling as long as skies remain clear because more radiation energy is emitted from the surface than it receives from atmospheric radiation and heat energy conducted to the surface from deeper soil. Simultaneously, the air will continue cooling because more and more heat is conducted to the colder surface, and the total height of the cooled air layer will increase. Maximum inversion intensity and height will occur shortly after sunrise because a short lag occurs before the sun begins heating the surface. 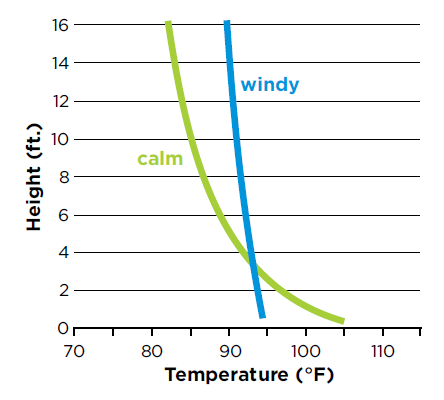 Wind speed is zero at the surface and increases exponentially with increasing height. Any surface unevenness or obstruction causes air to flow over or around it, resulting in horizontal and/or vertical eddies of various sizes. The result is a chaotic, random, swirling motion called turbulent flow in which wind speed and direction change rapidly. During an inversion, these eddies cause air from greater heights, where wind speeds and temperatures are greater, to mix with and/or replace slower-moving, colder air near the surface. Inversions are generally stable enough to resist this mixing action when wind speeds are less than 4 to 5 mph. As wind speed increases, inversions steadily are weakened and only weak ones will form. 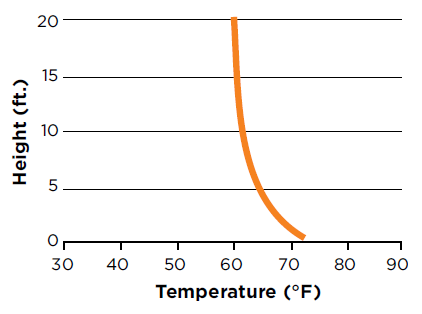 However, even in the windiest cases, surface temperature still will be less than air temperature because the surface is cooling continually on a clear night (Figure 5). Clouds are composed of water droplets and/or ice crystals that absorb and emit longwave radiation just like solid surfaces on Earth. However, ice crystal clouds are at much higher altitudes, so their temperatures are much colder than water droplet clouds. As a result, they emit less cloud radiation than water droplet clouds. Water droplets and/or ice crystals in the clouds absorb nearly all incident terrestrial radiation emitted from the Earth’s surface and simultaneously emit longwave cloud radiation back toward the Earth’s surface, where most is absorbed. Thus, cloud radiation is a huge additional energy source causing the Earth’s surface to cool far more slowly, compared with a clear sky condition (Figure 3). In general, greater cloud cover causes slower surface cooling and slower inversion formation in late afternoon or evening. This effect is less important during the daytime because solar radiation completely overwhelms the longwave radiation effects. When skies are completely overcast, the cloud layer absorbs nearly all of the terrestrial radiation and simultaneously emits nearly all of that energy back to the Earth’s surface as cloud radiation. Given this situation, the surface will cool very slowly or not at all, and inversion formation is highly unlikely. Given similar conditions, clear nights always will be colder than overcast ones. For these reasons, weather forecasters often make temperature forecasts contingent on whether the sky will be clear or cloudy. This also explains why the previous section on inversions begins by specifying clear skies. Generally, an extended period with clear or mostly clear skies during late afternoon or during the night is necessary for inversion formation because clear skies allow the maximum loss of terrestrial radiation to space. The longer the clear period, the more intense the resulting inversion will be. Partly cloudy overnight conditions mean that knowing if an inversion has developed is nearly impossible without air temperature measurements. In these cases, pesticide applicators must make a serious effort to determine if an inversion exists based on various indicators or actual temperature measurements at two heights or more. Air density continuously decreases with increasing height during an inversion because the air temperature increases with increasing height above the surface. This causes a density stratification of the air, with the densest or heaviest air near the surface and the density decreasing with increasing height. As a result, air can move only horizontally within the inversion (Figure 6). This is called laminar flow because it’s similar to the laminations in a sheet of plywood. When inversions are present, the lower atmosphere is classified as very stable because no vertical air mixing occurs. A Texas study showed that even wind speeds up to 4 to 5 mph do not disrupt it. A very stable lower atmosphere provides smooth rides for pilots, who often call it smooth air. Inversion intensity is defined for our purposes as the air temperature difference between two heights above the Earth’s surface or the top of a crop canopy (Figure 6). For example, subtract the air temperature measured 6 to 12 inches above the soil surface or a closed crop canopy from the air temperature measured at some greater height, perhaps 8 to 10 feet. The air temperature at the lower height always is subtracted from the higher one so inversion intensities are always positive numbers. The greater the positive temperature difference, the more intense the inversion, and the more stable, the lower atmosphere. Inversion height is the total thickness or height of the cooled inversion air layer. Because air temperature increases with height in the inversion, the top of the inversion is the height at which the air temperature stops increasing. Above this layer, air temperature begins to decrease with increasing height (Figure 6). Many interesting descriptions of temperature inversions and their characteristics can be found in various publications. Unfortunately, many are misleading or ambiguous, and some are just plain wrong. Inversions form during the evening, after the warm air already has risen: During the day, warmer air rises after it has been heated by the Earth’s surface. But by mid to late afternoon when the sun is getting lower in the western sky, incoming solar radiation begins to decrease rapidly. This causes the surface to begin cooling because it is emitting more terrestrial radiation energy to space than it is receiving from solar and atmospheric radiation. The cooler surface also begins to cool the nearby air and this could be the start of an air temperature inversion, as explained in the last section. Warm air traps cold air or spray droplets near the surface: Warm air does not trap cold air near the surface. Cold air is there because it’s denser than the air at higher elevations. Similarly, the implication is that spray droplets also are trapped in the colder air. However, what the observer actually sees is the dewpoint temperature line. Below this line, condensation or fog has formed because the air temperature is below the dewpoint. This line could be misconstrued as a dividing line between warm and cold air masses that do not exist within an inversion, as explained above. When spray droplets are added to the inversion, droplets above the dewpoint line will evaporate slowly. However, those below the line do not evaporate, so they may appear as if they are trapped. All spray droplets added to an inversion have a fall velocity. Even the smallest droplets will fall, but they take a long time. During this time, these small spray droplets will drift along with the wind. Ultimately, the distance they drift depends on when they evaporate or contact trees or other sensitive sites downwind. Water vapor is by far the most important greenhouse gas. The lower the dewpoint temperature, the less water vapor in the air to absorb terrestrial radiation emitted from the surface and emit atmospheric radiation back toward the surface. Thus, more terrestrial radiation is lost to space when air is relatively dry. This causes more rapid surface cooling, resulting in faster and more intense inversion formation. Dew or frost formation often occurs naturally during the typical inversion-forming process. If or when the upper canopy leaves cool to the dewpoint temperature during a clear, calm night, water vapor condenses on the leaf surface as dew, or as frost if the surface temperature is below freezing. Thus, dew or frost deposition always should serve as a warning that an inversion may exist. Fog: At the same time the surface has been cooling, the overlying air also has been cooling by conduction, but this is a much slower process. Condensation occurs and fog appears when the air temperature cools to the dewpoint temperature. Because conduction through the air is such a slow process, dew or frost always will appear before fog. The presence of fog nearly always indicates that an inversion condition existed prior to fog formation and that it has intensified. Because relative humidity is 100 percent in the fog and is very high even in the fog-free areas, little or no evaporation can occur. Introduced pesticide droplets will not evaporate, and even a light wind will move them like fog or with the existing fog and possibly affect susceptible crops downwind (Figure 7). Although heat capacity and thermal conductivity are closely related, they are not the same. Heat capacity is the total energy that soil or other surface material can store at its current temperature. Thermal conductivity indicates how fast heat energy is conducted into or out of the material. Except for a vacuum, motionless air is the poorest heat conductor known, and it also has low heat capacity. Because loose materials such as mulch, compost, crop residue or insulating materials have many air-filled pore spaces, they have very low thermal conductivity and heat capacity. For example, insulating material such as blankets or sweaters feel warm to the touch even when they are cold because of low thermal conductivity. Denser, low-porosity materials such as soil, stone or concrete have higher thermal conductivity and heat capacity. When they are touched, heat is conducted away from your skin rapidly, so they feel cold even if the material is only a little colder than your skin. In addition, their high heat capacity causes their temperature to change very slowly. When the sun heats a bare, uncultivated soil surface in the morning, much of that heat energy is conducted deeper into the soil than it would be through a less-dense, cultivated soil or a soil with a surface mulch. As a result, more energy is stored below the surface of the denser, uncultivated soil, and the soil’s surface remains cooler, compared with the cultivated soil, the mulched soil or other porous surfaces. The more porous mulched surfaces will be hotter throughout the day because only a shallow surface layer of the mulch is heated. As a result, the overlying air also will be hotter. In addition, large amounts of energy will be lost by terrestrial radiation because of the greater surface temperature. In mid to late afternoon as the sun sinks lower, these surfaces begin cooling. The mulched surface temperature decreases rapidly because of its low heat capacity, but the uncultivated soil surface cools far more slowly because some of the extra energy stored deeper in the soil during the day is conducted back to the cooler surface. Because little energy was stored under the mulched surface, its surface will be much colder than the denser soil surface. As a result, inversions form more rapidly over mulched or porous surfaces and also will be more intense. When surfaces are dry, most of the available energy during the daytime is consumed by heating the surface and a shallow layer of mulch or soil below the surface. Only a shallow layer is heated because the thermal conductivity of dry materials is much lower than moist or wet ones. As a result, large amounts of the available energy will be lost by terrestrial radiation because of the high surface temperature. When soils or other surface materials are wet, water evaporation consumes most of the available energy during the daytime, keeping surface temperatures low. Because moist or wet soils have greater thermal conductivity than dry soils, energy will be conducted into wet soil faster, but temperatures will rise more slowly because of the greater heat capacity of the water. Because surface temperatures remain low, far less energy is lost by terrestrial radiation. The end result is that surface temperature will be lower in wet soils during the daytime because of evaporation, but it will be greater at night because some of the energy stored deeper in the soil is conducted back to the surface. Cultivation can cause dry soil to act like mulch because it increases the soil’s pore space, which decreases its thermal conductivity. Cultivation also causes moist soil to dry more quickly. Surface temperature of recently cultivated soil will be greater during the day and lower during the night, compared with an uncultivated soil. As a result, inversions will form more quickly and be more intense over the cultivated soil. By two or three hours after sunrise, most solar rays are hitting the upper leaves of a closed canopy and all or parts of lower leaves that are not shaded. The sunlit leaves that “see” the sky have become an elevated Earth’s surface. The sun heats these upper leaves, but little solar radiation reaches the lower, shaded leaves or the soil surface. As the sun continues to rise, the temperature of the sunlit leaves rises rapidly because of the leaves’ low heat capacity, and these leaves begin conducting energy to the nearby cooler air. When the nearby air temperature increases, convection cells begin growing and transporting heat energy higher and higher into the atmosphere. Simultaneously, these warmer sunlit leaves are emitting large amounts of longwave terrestrial radiation to the sky. In contrast, the shaded lower leaves have warmed only a little, and the soil surface temperature hardly has changed. The maximum surface and air temperatures at the top of the plant canopy occur in early to midafternoon, just as they would for any other surface exposed to the sun, but little energy has been stored in the canopy because of the leaves’ low heat capacity. Sometime in mid to late afternoon, the solar radiation will have decreased enough so that the total incident solar and atmospheric radiation is less than the longwave terrestrial radiation emitted by the canopy. At this time, the upper leaves begin to cool because they are emitting more radiation energy than they are receiving. The leaves will cool very rapidly because of their low heat capacity. The lower leaves and the soil surface remain warmer because they are protected from the clear sky by the upper leaves. Because the upper canopy leaves are now colder than the adjacent air, heat energy will be conducted from the warmer air to the cooler leaves, where it will be lost as terrestrial radiation. Because upper leaves have low heat capacity and their only heat source is the shaded leaves, they will cool to significantly lower temperatures than a bare-soil surface. Therefore, inversions over closed-crop canopies will form sooner in the evening and probably will be more intense than those forming over a bare-soil surface. Open-crop canopies are far more complicated than this because the Earth’s surface consists of a mixture of leaves at various heights and exposed soil. In general, as the amount of vegetation decreases from a closed canopy, the more the surface will act like bare soil. Tree shelterbelts were planted to reduce near-surface wind speed to decrease soil erosion or control snow drifting. They are most effective when the wind blows perpendicular to them. For dense shelterbelts with little through-flow, winds are reduced greatly near the windbreak, but wind speed fully recovers at about 15 times the height of the trees downwind. More open shelterbelts (single tree rows) allow more through-flow so wind speed is reduced less near the trees, but the downwind effect persists for about 30 times the shelterbelt height. Wind speed in both cases also is reduced upwind for a distance equal to three to four times the tree height. Reduced wind speed near shelterbelts causes reduced air turbulence or mixing day and night. As a result, daytime surface and air temperatures in sheltered areas are greater, compared with those in open areas. However, when the surface is cooling at night, reduced mixing causes lower minimum temperatures, compared with open areas. The result is often earlier inversion formation in the evening and later dissipation in the morning. Reduced turbulence also causes higher humidity and dewpoint temperature day and night. This combination often leads to earlier dew formation at night and slows evaporation in the morning. However, this is somewhat determined by shelterbelt orientation. Shelterbelt orientation affects solar radiation. A crop planted on the south side of an east-west-oriented shelterbelt receives full sunlight, plus an extra 15 to 25 percent solar radiation that’s reflected from the shelterbelt. This causes greater surface and air temperatures, and greater evapotranspiration, compared with the cooler, shaded areas on the north side. Thus, northside soils tend to be cooler and wetter, and dewpoint temperatures are greater than on the south side. North-south-oriented shelterbelts also are affected even though they are symmetrical with respect to solar radiation. Plants on the east side of the windbreak receive full and reflected solar radiation in the morning. Some of this energy is used to heat the plants and air, and to evaporate any dew. The shaded westside plants also are warming slowly and dew is evaporating slowly during the morning. During the afternoon, the westside plants receive similar amounts of solar energy, but now all of this energy is used to further heat the plants and air. This causes greater afternoon plant and air temperature on the west side, compared with the shaded east side. As a result, the west side of the north-south shelterbelt will tend to be hotter and soils will be drier than on the east side. This may result in earlier inversion formation on the west side. The coldest, densest air always is found near the Earth’s surface on clear, mostly calm evenings. Where topography is uneven, the coldest air begins to flow or drain slowly down the slopes until it pools in depressions or valleys. This cold air drainage begins shortly after an inversion forms and is most prevalent and noticeable in regions with gently to steeply rolling topography or mountain valleys. Inversions in these valleys often result in major air pollution or smog alerts because any smoke or other odors are trapped in the cold air pool. Some people believe cold air drainage is important only in areas with steeper terrain. However, it can and does happen in areas with very gentle slopes. In most cases, cold air drainage is not visible. However, in some cases, the air temperature decreases until it equals the dewpoint temperature of the air, and condensation (fog) forms so we can see the cold air drainage (Figure 8). When morning ground fog is visible only in lower-lying areas, it could be caused by standing water, which results in higher dewpoint temperatures and fog. But when standing water is not present, fog in these areas is proof that cold air drainage has occurred (Figure 8). Fog always forms first in the low-lying areas, and early autumn frosts are also most likely in these areas. For the same reasons, inversions usually will form first and probably will be more intense in low-lying areas. Reduced turbulence also causes higher humidity and dewpoint temperature day and night. Spraying during an inversion never is recommended, even with drift-reducing nozzles or drift retardants. Drift-reducing nozzles or drift retardants still produce some fine drops less than 200 microns in diameter that are likely to drift. During an inversion, the air temperature increases with increasing height above the soil surface. As a result, the coldest, densest air is at the surface and its density steadily decreases with increasing height. The result is a very stable stratification of air that prevents vertical air motion. A very stable atmosphere is characterized by low wind speeds and only horizontal, laminar flow. A Texas study has shown that wind speeds of 4 to 5 mph do not disrupt an inversion because of this inherent stability. When an applicator introduces spray droplets into very stable air, the larger drops with greater fall velocities strike the surface within one to three seconds. However, smaller droplets (200 microns in diameter and less) fall as little as a few inches per second and may float along with the air for long distances. Releasing smoke from an aircraft at application height and observing how quickly it dissipates is an excellent means of assessing the presence of an inversion. The early morning hours shortly after sunrise, when wind speeds are low, may appear to be a good time to apply pesticides. However, when overnight skies were clear and wind speeds are low, that’s usually one of the worst times. Given these circumstances, sunrise is usually the time when minimum air temperature and maximum inversion intensity occur. The presence of ground fog in the area would confirm that an inversion exists. If no fog has formed, look for dew on the upper exposed leaves of the crop canopy to confirm the inversion. Dew nearly always occurs before fog because the surface leaf temperatures are the coldest. However, the absence of dew does not guarantee the absence of an inversion! Lack of dew simply means that leaf surface temperature has not cooled to the dewpoint temperature of the air. An instrument that measures dewpoint temperature may be useful for confirming a low dewpoint in cases such as these. An infrared thermometer that measures surface temperature also may be useful to measure the crop canopy temperature to determine if it is close to the dewpoint temperature. However, only one small area of the field is being measured, and conditions may vary greatly throughout the field. Aerial applicators should pay particular attention to the flying conditions at spray height. During an inversion, air near the surface is very stable because it is stratified by density. As a result, an airplane will experience little or no turbulence when flying through this air. Some aerial applicators call this smooth air, and it is a clear indication that an inversion exists. In the absence of dew, the only way to determine if an inversion exists is to measure the air temperature 6 to 12 inches above the ground or the top of a mostly closed-crop canopy, and at a height of 8 to 10 feet above the surface to be sprayed. If the temperature at the higher level is greater than the temperature at the lower level, an inversion exists. The greater the temperature difference between the two levels, the more intense the inversion and the more stable the lower atmosphere. The air temperature should be measured in an area where soil and crop conditions are the same as the area to be sprayed. If soil near the field entrance is packed and/or the crop has been driven down, avoid that area. An inversion will not dissipate like dust or smoke clouds. A definite process is involved that requires solar radiation to warm the surface and time for the surface to warm the lowest 15 to 20 feet of the atmosphere to eliminate the inversion. Studies have shown that an inversion usually persists for one to two hours, and sometimes longer, after sunrise on a clear calm day, depending on the surface conditions. Thus, early morning spraying when the lower atmosphere is transitioning from stable to unstable may be a problem. However, in the morning when skies are clear, solar radiation slowly is weakening the inversion and eventually will eliminate it. But spray applicators need to use extreme caution in mountainous areas, protected valleys, basins, and the lower areas and shaded hillsides of some steeply rolling topography because cold air drainage can cause very intense inversions in these areas. Measuring air temperatures at two heights is strongly recommended before spraying in these high-risk areas. Decreasing solar heating by mid to late afternoon causes convection cells to weaken, cumulus clouds to begin evaporating and wind speeds to decrease. Terrestrial radiation cools the surface fastest when skies are mostly clear, the air is dry and wind speeds are low. As the surface temperature drops below the adjacent air temperature, heat is conducted from warmer air to the cooler surface, where it’s lost as terrestrial radiation. In addition, heat is conducted to the surface from warmer soil below it. This is the beginning of an air temperature inversion. These processes continue causing a slow, steady decrease in the surface temperature and air temperature near the surface (Figure 4). As the cooling continues, the inversion steadily intensifies and its height grows. Generally, the transition from an unstable to a very stable (inversion) lower atmosphere begins about one to three hours before sunset, but it can happen earlier. During a study at the North Dakota State University Microclimatic Research Station in the late 1980s and 1990s, air temperatures were measured with shaded sensors at five heights, ranging from 4 inches to 5 feet above a turf-covered surface. These data indicate that inversions in the lowest 5 feet sometimes begin forming three, four and even five hours before sunset. Based on these data and other observations, evening inversions pose a greater risk for spray drift than morning inversions. This is because evening inversions, once formed, are very persistent as long as skies remain clear. The inversion will continue to intensify until shortly after sunrise. Usually only windy or cloudy conditions will weaken or disrupt it, and both of these usually require some significant weather or air mass change. Low wind speeds three to four hours before sunset may appear to be ideal conditions for pesticide application, but once again, this can be deceiving. When accompanied by clear skies, these conditions are ideal for rapid inversion formation. An inversion, plus low wind speed, is the best possible situation for long distance damaging drift of spray droplets. A telltale sign that an inversion already has formed is road or field dust rising slowly or hanging in the air near the surface. The dust tends to drift along with the wind but dissipates very slowly. Similarly, a strong odor you normally don’t smell or distant sounds you normally don’t hear also indicate the presence of an inversion. Some aerial applicators have planes equipped with smokers. This allows them to release smoke and observe how it moves and dissipates, which will help discern the presence of an inversion. Another inversion indicator for aerial applicators is the presence of smooth air that usually accompanies an inversion. Although this is a useful indicator during morning inversions, it may not be useful in the evening because of the time the inversion takes to reach typical aerial application heights. During clear, calm evenings, inversion formation begins with surface cooling and then air very near the surface is cooled. However, the top of this cool air increases very slowly because the air is cooling by conduction, which is a very slow process. Thus, the cool air may take several hours to reach a height of 12 to 14 feet, depending on conditions. To confirm the presence of an inversion, air temperature should be measured at two heights: 6 to 12 inches above the sprayed surface or 6 to 12 inches above the top of a nearly closed-crop canopy, and at a height of 8 to 10 feet above the surface to be sprayed. When the temperature at the higher level is greater than the temperature at the lower level, an inversion exists. The greater the temperature difference between the two levels, the more intense the inversion, and the more stable the lower atmosphere. Evening is very different from mornings for inversion formation. During a clear morning, an inversion that formed the previous evening or night is dissipating. But on a clear evening with low wind speeds, the applicator must be extremely observant because an inversion already may be forming and is intensifying steadily and growing in height. Most off-target movement of pesticides is derived from the physical movement of spray droplets caused by wind. However, following deposition, some pesticides convert into gasses that move off target and into the atmosphere. These pesticide vapors are held in the relatively cool, dense air near the ground in an air temperature inversion. Thus, they easily can move laterally down range in light winds until the inversion is dissipated by stronger winds and/or turbulence from ground warming of the lower atmosphere. Once these volatile pesticide gasses enter the atmosphere, they move and behave in a similar manner as extremely fine spray droplets. However, they differ from droplets in that they do not evaporate. Further, gassing off of pesticide vapors from the treatment area can occur for many hours or even days following application. These gasses may be subjected to multiple air temperature inversion cycles. During the middle of the day, the vapors disperse widely in the atmosphere, but when an air temperature inversion is in place, they once again are concentrated near the Earth’s surface. Because volatile pesticides are being released into the atmosphere during a period of time after application, the off-target movement of them during an air temperature inversion is unpredictable. When using pesticides that volatilize, applicators should monitor the weather and follow pesticide labeling instructions carefully to avoid practices or environmental conditions that favor volatility. The best option is to measure the air temperatures in an area where soil and crop conditions are the same as the area to be sprayed. If soil near the field entrance is packed and/or the crop has been driven down, avoid that area. Before taking temperature measurements, make sure the instrument has had time to equilibrate to the outside air temperature in the measurement location, especially if it has been stored in a hot (or cold) vehicle or in your pocket. The air temperatures being measured may differ only by a few degrees, so take measurements carefully. The instrument’s temperature sensor must be shaded the entire time because solar heating can cause a false higher temperature reading. Some combination wind speed and air temperature instruments may provide partial shading for the temperature sensor. When using this type of instrument, make sure the entire instrument has been equilibrated to the outside air so its temperature does not affect the measured temperatures. To equilibrate the instrument or measure an air temperature, start by reading and noting the instrument’s current air temperature. Then position the shaded instrument so air moves past the temperature sensor while you slowly move the instrument back and forth horizontally to enhance the air flow, especially in low-wind conditions. A noticeable wind may provide enough airflow past the instrument’s sensor to equilibrate it without moving it. But keep the instrument shaded the entire time. Check the temperature reading periodically, and when the temperature remains constant for a minute or so, record the temperature. A vehicle or other tall equipment may be used to shade the temperature sensor. Take special care if that equipment is hotter than the air temperature you’re measuring. Longwave thermal radiation emitted from hot equipment may cause a false high temperature reading. If the equipment feels hot, don’t use it for shade. You also may use your body for shade at the 6- to 12-inch height. When making your first air temperature measurement, place or hold the sensor at the desired height in the shade. Then repeat the same procedure used to equilibrate the sensor, making sure it’s shaded the entire time. Check periodically until the temperature remains nearly constant for about a minute. This is the air temperature at that height. Repeat the same process at the second height, making sure the sensor is shaded. Measuring air temperature accurately at the 8- to 10-foot level would be faster and more convenient by constructing a thin mast with instrument mounts and shades at the desired heights. This would make the instruments easier to hold without having to look for shade. If you have two instruments, you even could measure the air temperature at both heights simultaneously. However, if you use two instruments, make certain both instruments are calibrated to read exactly the same temperature in a controlled, shaded temperature environment. Calibrate them at typical temperatures that you encounter in the field, and calibrate them periodically throughout the season. The air temperatures being measured may differ only by a few degrees, so take measurements carefully. Fine drops are generated from the best drift-reducing nozzles and may stay suspended in an inversion and drift laterally onto sensitive sites. Use spray nozzles that produce the coarsest drop allowed for the pesticide you’re using. Nozzle manufactures provide drop-size distributions at typical operating pressures for nearly every spray nozzle manufactured for ground and aerial sprayers. The American Society of Agricultural and Biological Engineers has produced a drop size classification system for applying pesticides to crops. Most pesticides include a drop-size recommendation that provides the best control of the pest. If you don’t have a drop-size distribution for your nozzles, contact the nozzle manufacturer for it. If small drops are required for effectiveness, the applicator must decide if application is warranted given the current weather conditions. Consider the possibility of downwind crop injury and illegal pesticide residues. Pesticide applicators always should use extreme caution because all spray nozzles produce at least some drops smaller than 200 microns in diameter. These drops, even in small amounts, may cause problems because they will remain suspended for considerable periods of time, especially in an inversion. When wind speeds are low, the air will be moved downwind, carrying these droplets with it. For these reasons, knowing if an inversion exists or is forming, and if sensistive sites are downwind, is imperative for a spray applicator. Behrens, R., and W.E. Lueschen. 1979. Dicamba volatility. Weed Sci. 27:486-493. Fritz, Hoffmann, Lan, Thomson and Huang. 2008. Low-Level Atmospheric Temperature Inversions: Characteristics and Impacts on Aerial Applications. Agricultural Engineering International: the CIGR Ejournal. Manuscript PM 08 001. Vol. X, May 2008. Hamilton, W.H, and J.D. Carlson. 2007. Movement of Odors Off-Farm. BAE-1793. Oklahoma Cooperative Extension Service publication. Hofman, Vern and Solseng, Elton. 2004. Spray Equipment and Calibration. AE-73. NDSU Extension Service publication. Ogg, Clyde; Editor. 2006. Aerial Pest Control for the Commercial/Non-Commercial Pesticide Applicator, Second Edition. University of Nebraska-Lincoln publication. Oke, T.R. 1987. Boundary Layer Climates, 2nd Edition, Methuen and Co.
Robinson, Elmer, and Lawrence L. Fox (1978) 2,4-D Herbicides in Central Washington, Journal of the Air Pollution Control Association, 28:10, 1015-1020.